Preheat oven to 425 degrees F. Place a nonstick wire rack on a baking sheet. In a small bowl, combine panko, parsley, basil, thyme, parmesan, salt, pepper and garlic. Mix up with your hands to get everything combined. If you like, peel the sweet potatoes (or not) and slice into rounds about 1/4 of an inch thick. Place in a larger bowl and drizzle with olive oil, then flip around your hands to make sure each piece is coated. Add in panko and herbs, tossing again with your hands and pressing lightly to adhere. Some will stick – some will not. Place potato rounds on the wire rack, and then sprinkle the remaining panko and herbs over the potatoes. Bake for 25-28 minutes, or until crust is golden and sweet potatoes are soft. After making and serving the potatoes bites, I found that some thicker slices were a bit harder or still had a crunch to them (meaning they were not cooked all the way through). 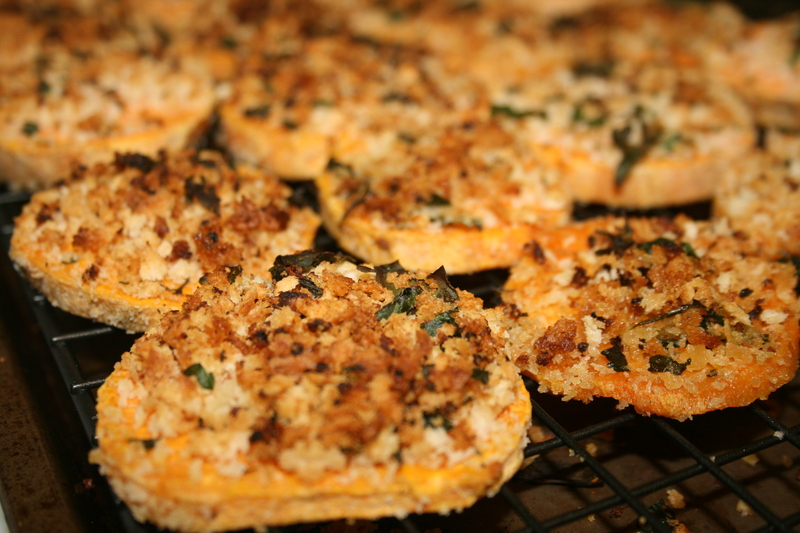 Though I did no try doing this, I think baking the slices of sweet potato for a few minutes before adding the herb and panko mixture would make them perfect. I recommend baking them before adding the mixture because the breadcrumbs crisp up just right in the normal baking time (and you don’t want them burned!). *In regards to the amount of herbs and bread crumbs for the mixture: You can really play with the amount you use. I followed the recipe as a guideline, but because I was making for a larger crowed I added more as I went based on how much I wanted the sweet potato slices covered.